Fire Prevention: The Santa Cruz Mountains have a long history of catastrophic wildfire. 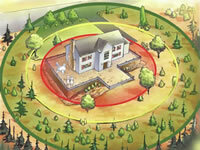 Owners and managers of property in wooded areas need to ensure that fire roads are clear of flammable material, that fire breaks are available, and that homes and buildings are fortified by defensible space. The RCD has programs and services for financial or technical assistance with fire mitigation. Rural Roads: Santa Cruz County is home to thousands of miles of rural roads. These roadways are subject to erosion from stormwater runoff and regular use. Many rural roads are threatened by undersized, damaged, or improperly installed culverts and grading that doesn’t effectively handle excessive water. In addition to affecting the availability and use of needed roadways, poorly constructed and maintained roads add sediment to the waterways within the watersheds. Sediments can harm coho and steelhead salmonid populations which are found in local waterways as well as coastal marine ecosystems. 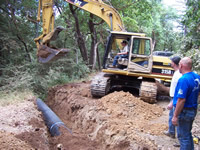 The RCD has programs for financial or technical assistance with rural road repairs and maintenance. Erosion Control: Eroding slopes and hillsides can threaten homes, buildings, and roads and can contribute large amounts of sediment to the waterways within the watersheds. Sediments can harm coho and steelhead salmonid populations which are found in the watersheds as well as coastal marine ecosystems. Sediment can also pose a danger to water supply by damaging filtration equipment. 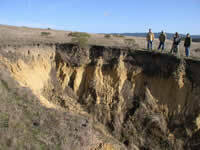 The RCD has programs and services for financial or technical assistance with erosion control. 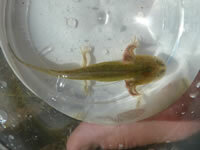 Protecting Endangered Species: Santa Cruz County is home to more than 20 endangered or threatened plant and animal species, including Coho, Steelhead, Sea Otter, California Red-Legged Frog, and the Santa Cruz Long Toed Salamander. Property owners and land managers have asked how they can help protect endangered or threatened species. The RCD has programs and services those who want to learn about protection of species, or to host or volunteer to help with a project that benefits species. 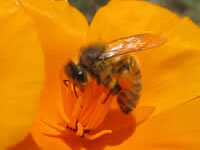 Attracting Pollinators: Pollinators are essential to our environment and the productivity of local farms. The ecological service they provide is necessary for the reproduction of nearly 70 percent of the world’s flowering plants, including more than two-thirds of the world’s crop species. The RCD has programs and services for financial or technical assistance with planting pollinator-attracting landscapes. Managing Stormwater: In developed areas, roofs, pavement, and other impervi­ous surfaces prevent stormwater from soaking into the ground. Instead, it runs over the land surface and directly into small tributaries and larger streams. Unable to handle the increased water volume and flow, these water bodies often experience eroded banks, incised channels, loss of habitat and aquatic life, and increased flooding and prop­erty damage. In addition, stormwater carries a broad mix of toxic chemicals, bacteria, sediments, fertilizers, oil and grease to nearby water bodies. Retaining as much stormwater as possible on the land— rather than letting it run directly into storm drains—can help keep harmful flows and pollutants out of our streams and rivers. 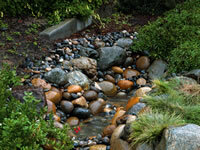 The RCD has programs and services for financial or technical assistance with stormwater. Planting Native Vegetation/Removing Invasive Weeds: The abundance of non-native invasive plants in Santa Cruz County poses a real threat to native plants and wildlife. Of paramount importance is the assault on riparian corridors, where the unique plant communities consist of the vegetation growing near a river, stream, lake, lagoon or other natural body of water. 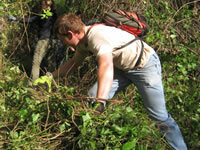 Invasive species are marked by their ability to spread easily and rapidly; an example is English ivy, which grows over native trees, depriving them of light. The trees eventually die, resulting in a decline of critical nesting habitat for migrating birds, diminished shade that is vital for fish health, and a breakdown of stream-bank stabilization. The RCD has programs and services for financial or technical assistance with planting native vegetation or removing invasive weeds. 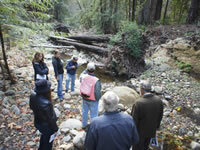 Stream Care: Santa Cruz County streams are home to a wide variety of native fish, plants and wildlife. Our local streams support native fishes that include steelhead, coho salmon, Pacific lamprey, Sacramento sucker, prickly sculpin, three-spine stickleback, and California roach. Our local streams also support sensitive wildlife species such as the California red-legged frog, foothill yellow-legged frog, and western pond turtle. Residents living beside or near the creeks, streams, and waterways want to know the best ways to protect and care for water quality and local critters. The RCD has programs and services for those who want to learn about stream care, or to host or volunteer to help with a project that benefits species.